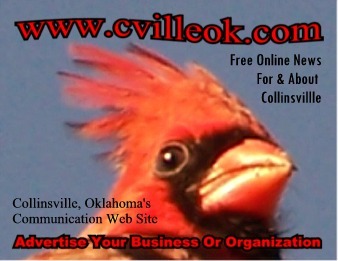 In all cases I will edit my cvilleok.com logo into any photo before sale. Photos included are those taken since 2003 for the www.cvilleok.com web site. Photo before that date would be covered under the "Research" policies. 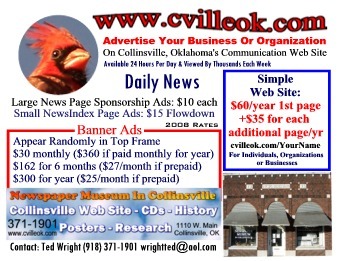 * You can copy a reduced sized photo from the cvilleok.com web site for free ... for personal use ... as it will already have my cvilleok.com logo embedded. If you wish to use cvilleok.com material for commercial use contact Ted Wright. * I can edit a new full-sized version of photos and email to you for $2 each. I have no online payment system in place yet so you would have to mail or bring payment to the Newspaper Museum In Collinsville (1110 W. Main). I am a one-person business and the office is often locked, with no set business hours as I have to attend meetings, games ...etc. You can put payment through the mail slot if I am not there. * I also have the option to put all digital prints for a season on a CD for $25/sport. I did a few for $10 this past year and there was much more work involved than I expected. It would take too much time to edit in the logo or eliminate bad prints (i.e. too dark or out-of-focus) ... so they are all as-is ... and no permission is given for re-sale or publication. I have a stack of more than a year's worth of requests for obituaries, family or business information from the 1902-1987 files of Collinsville newspapers. I have not had time (or motivation) to complete them -vs- the higher priority to maintain the www.cvilleok.com web site and sell advertising (which will hopefully pay the bills). New (or existing) requests will be considered only with a pre-paid $20 minimum for a single specific date supplied article. Each additional specific-date request would be $10/each if pre-paid at same time as first request..
Requests for non-date supplied searches will only be considered with a pre-paid $50 mininum down payment against $15/hour to continue the search. There is no guarantee that requested material will be found. Note: This new pricing policy overrides the pricing on the Newspaper Museum web site.... but that site does have other information that would be useful to consider in requesting research. Museum Tours A simple introductory tour of the Newspaper Museum In Collinsville is free. There is also a donation jar which can help keep the museum open with your help. Note: I do not typically run an air conditioner or heater. If you wish a tour that is at a temperature much different that outside temperature you will need to make advance arrangements and pay accordingly. In most cases it is best to schedule a tour in advance as I do not keep regular hours. If you catch me at the museum (& I'm not working an emergency) drops-ins are fine. Call or email to set a tour time. I am often here late nights and weekends ...etc. I often work with the door locked ... so knock if in doubt. Slide Shows $25 minimum (will consider less for non-profit organizations). I have a number of pre-prepared slide shows on historical Collinsville topics. If I need to create a slide show specifically for your selected topic the price increases depending on the subject and availability of photos and/or news stories (i.e. may start falling into the research category prices above). I can bring my laptop and projector to your location and narrate as required. I can also create slideshows of more current topics such as CHS sports events/seasons ...etc. Posters $20/ea minimum (email for details ... this is another area I am way behind on). Black & white low-resolution prints from historic Collinsville photos ... approximately 2x3 foot. Requires 2 trips to Tulsa, so I don't do these often. I am considering an up-to-date CD for the City Hall open house late in 2005 with a TBA price. You can stop by the museum for a quick demo if you are unsure what is available on any of the CDs above. Photography If you need photos taken at an event and I am available ... we can discuss a pricing plan to match that event ...as an extension to the photo pricing above. Video is a possibility also ... but it is tough to do both at the same event. If you attend a Collinsville related event & I am not there ... please email info and photos. If you hear of news, call or email.